This is my approach to make a Krieg melee fighter. 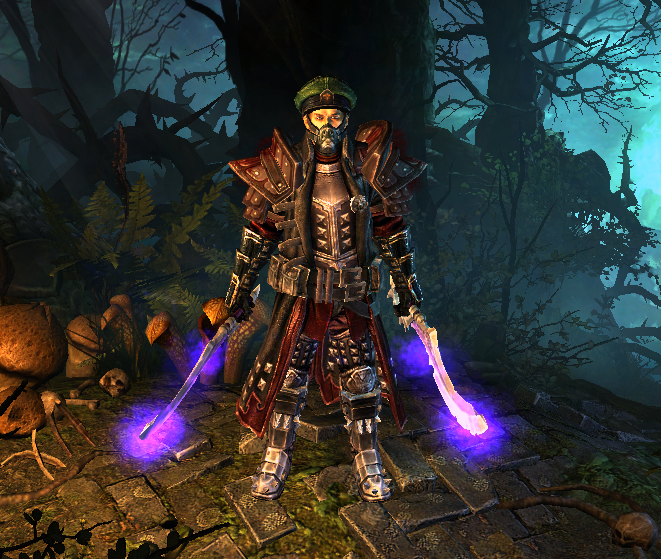 Nothing new: full Krieg set, double Mindwarp plus slight refinement. Contrary to good classic shield-wielding Krieg this one became an ultimate slaughter machine. It's a Death Knight using Cadence fully converted to Aether and partially to Vitality. Main damage skill of this build is Cadence. 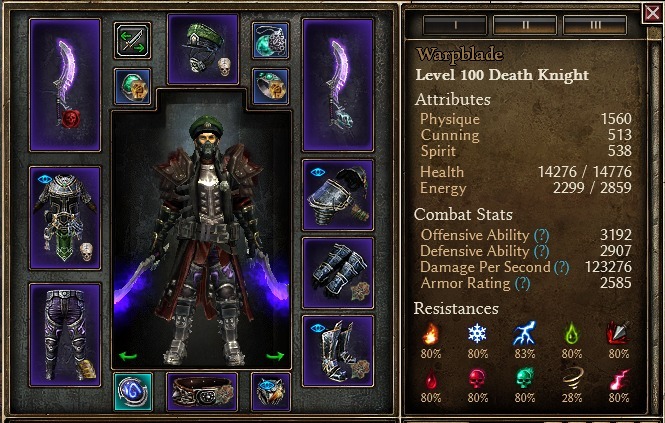 Core items for this build are double Mythical Mandwarp and Krieg's Armament set. 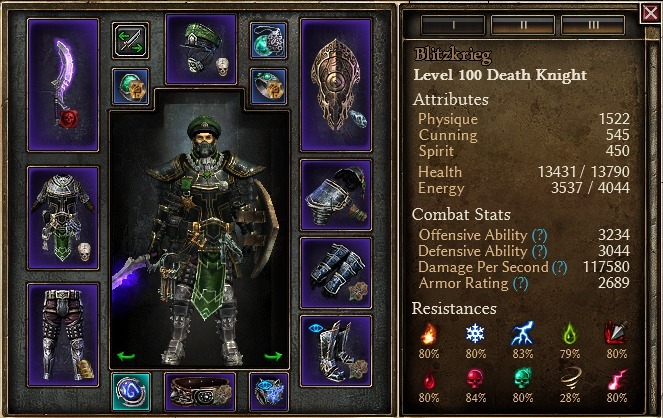 Build's defenses include huge HP pool (~25k in Crucible), decent armor, 18% constant ADCtH and Mark of Torment. Ghoul is used as circuit breaker. As always, Anasteria is annoying, be careful with her. And watch Alek's meteors too. All combinations of nemeses are facerolled. Double Reapers are dangerous due to whooping 96% aether res, kiting is needed. Solemn Watcher, Spear of the Heavens, Aeon's Hourglass. After completing Ghoul, Sailor's Guide and Scholar's Light you'll surely have useless red, blue and green nodes at the Crossroads, remove them using Spirit Guide. Strannik - pointing out that WPS are needed here too. tr1p and John_Smith - brilliant idea with Necrotic Edge. Last edited by veretragna; 02-05-2019 at 08:45 PM. I see the alternative way to assemble this build with Mythical Dismember Stone, Magelord Rings and Soul Harvest. Better damage but needs further testing. Last edited by veretragna; 09-07-2018 at 08:55 PM. Its such a pain to sustain Soul harvest just for the buff on autoattacker. And it can as well result in DPS loss for cadence build due to missed cadences. Agreed. But look at this sweet damage! I found perfect Magelords after 1500 hours Not sure why ppl hate green stuff so much, there is a good chance to drop some goodies in crucible. Now resistances are very tight but somewhat balanced. I'll test this one tomorrow and update this thread. I agree, finding a great double rare should improve your build, not be a requirement to making it work. My opinion, anyway, but given the rarity of these items it seems the right thing to do when posting a build. Wasn't this done already? I swear I saw this DK build somewhere on forums. Curious if well-rolled heart of theodin marcell will be outperforming cadence with full wps pool. Idk if I got my math right but calculating single target weapon damage, cadence at 255% average weapon swing (counting wps and the chance of fastcharging cadence with dw non wps attacks) edges out fleshwarped strikes at 201% weapon damage (9/12 markovian, 12/12 zolhan, 12/10 reaping strike, 12/12 necrotic). Including the non WD flat dmg, I haven't calculated that.